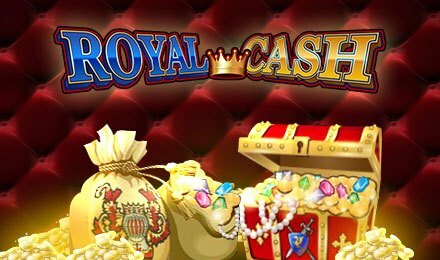 Powered by iSoftBet, Royal Cash is a 5 reel and 50 payline slot game which takes you on a unique journey to meet the royals of iSoftBet. The King and Queen await your arrival, at Wicked Jackpots Casino, where you could enjoy this regal theme! When launched, enjoy features like; wilds, multiplier wilds, and free spins! On the wonderfully designed reels, match three or more symbols like; gold accessories, bags of jewels, crowns, treasure chests, kings and queens to trigger wins. The highest paying symbols of the game are Kings and Queens, which award 2,000 and 1,000 coins for a five-symbol combination! Click on the “Gear” looking button to access all options of the game. You will find the Bet Tab, on which you can pick your stake. Autoplay is at hand, and will allow you to set Royal Cash slot to auto. Coin Values: Bets range from £0.50 to £250.00. Royal Cash comes with 5 wild symbols. The standard wild replaces all other symbols bar the scatter, as well as four other multiplier wilds. These symbols land on the 5th reel to boost any winnings, and appear by values of 2x, 3x, 5x and 10x.